4 Color Modes and Adjustable Brightness : Choose the 4 color modes by press"M",Press the"∧"or "∨"button to increase/decrease brightness. Hours Timer Setting and Memory Function:Touch the "1H"/"2H "button. Automatically turn the light off after 1 or 2 hours .Save memory of the last brightness and color temperature. 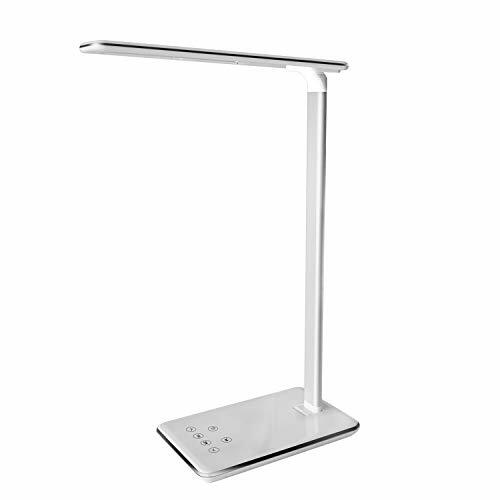 Convenient USB Charging and Touch Controls：this desk lamp can be used to power smart devices while you sleep with a built-in 5V/1A USB port. Eye-caring and Energy-Efficient LED illumination:50000 hours lifespan, Provide a soft, stable and non-flickering light environment which is friendly to your eyes. 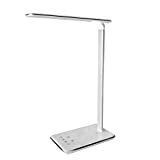 Portable and Flexible Design：Adjustable head tilts up to 120°and arm tilts up to 90°,which is convenience for you to adjust the light with perfect angle .Good choice for travelers, office workers and students.